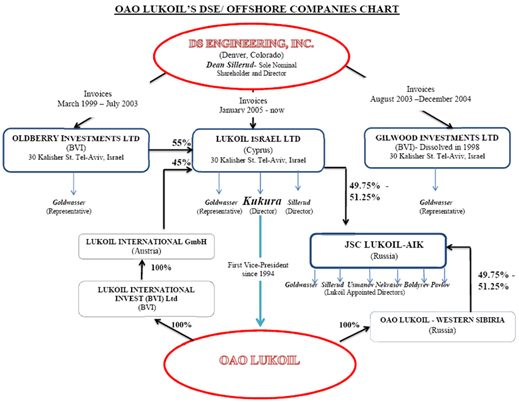 LUKoil, Russia’s second oil producer and exporter, has been running an illegal cash smuggling scheme out of front companies in the US, and diverting millions of dollars into a slush fund through an Israeli front company, according to court papers filed in the US yesterday. The mastermind, the US documents allege, is Sergei Kukura, LUKoil’s chief financial officer (image). Kukura is named in a 68-page filing by lawyers for Archangel Diamond Corporation (ADC) in the Denver District Court. This is in reply to a motion by LUKoil to dismiss the long-running litigation, in which ADC accuses LUKoil of stealing its rights to the Grib diamond pipe, in Arkhangelsk region. 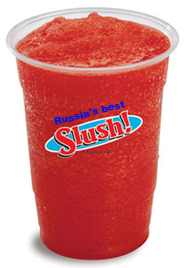 Lukoil pleads its innocence on the substance of the claims. It also argues that the US court has no right in law to try the claims, because LUKoil has never done significance business in Colorado, and is not subject to the jurisdiction of the state court. Kukura, 51, is listed on LUKoil’s website as the first vice president of LUKoil for economics and finance; this is the equivalent of chief financial officer in western corporate parlance. 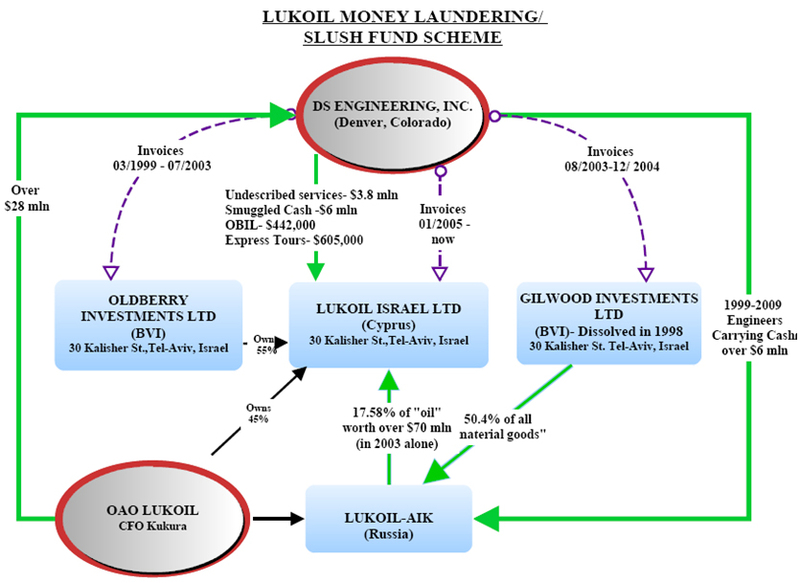 In the court papers, new evidence has been reported from investigations in Israel, Cyprus, the US and Moscow, allegedly showing that Kukura has been in charge of companies which have been engaged in secretly running cash from Colorado into LUKoil’s operations at oilfields in Russia, and running cash out of Russia into slush funds offshore. The significance of the discoveries, ADC claims in its submission to the Colorado court, is that LUKoil has been doing business in Colorado for the entire time period in which ADC, headquartered in Denver from 1997, has been trying to recover its diamond mining rights from a LUKoil affiliated company, Arkhangeskgeoldobycha (AGD), and from LUKoil’s chief executive, Vagit Alekperov and his partner, Alisher Usmanov. In addition, this week’s court submission charges, LUKoil has been lying to the court in claiming it had no business in the state; and knew nothing of its executives’ involvement in a subsidiary, LUKoil Israel Ltd. 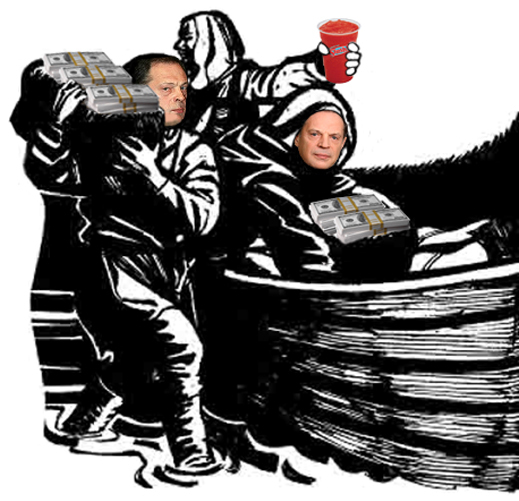 If the court accepts the new evidence and allegations, and upholds ADC’s argument that LUKoil is subject to the jurisdiction of the Colorado court, Alekperov and Kukura (along with Usmanov and other Russian executives) face possible Russian investigations of violations of Russia’s money-laundering and tax laws; and possible US investigations of parallel violations. If the court finds in ADC’s favour this time, it will order a trial in the US on ADC’s charges of contract violations, fraud, and unjust enrichment. ADC’s claim is for more than $500 million in costs, loss of its mining rights, and triple damages for racketeering. The Usmanov named in the latest court document is not Alisher Usmanov, who was named in much of ADC’s litigation record, and who has been Alekperov’s business partner in VA Invest and other companies; these were involved in the long-running diamond mine scheme before Alekperov reportedly bought out Usmanov’s interest. It is not known what relationship, if any, Anatoly Usmanov has to Alisher Usmanov. The latter is not a defendant in the ADC litigation, and he has denied involvement in the alleged theft of the diamond mining rights. He has been named by ADC as one of the witnesses it wants to testify if the case comes to trial. ADC has been pursuing its half-stake in the Russian Grib diamond pipe since 1998, alleging that Lukoil, its chief executive Vagit Alekperov and his partner Usmanov, have illegally withheld from ADC its mine licence and project rights. The last report of the court proceedings in Colorado was a year ago, when the presiding judge was forced to withdraw for a conflict of interest. The Grib pipe, at Verkhotina, in northwestern Russia’s Arkhangelsk region, was assayed by De Beers several years ago, and on those data it is the one of the world’s largest undeveloped diamond deposits. First discovered in 1996, a total of 68 boreholes totaling 19,557 meters were completed by ADC, before the alleged asset raid by the Russians halted work. A resource estimate prepared in 2000 by ADC counted 98 million tonnes of kimberlite to a depth of 500 metres, containing an estimated 67 million recoverable carats. The grade has been estimated by De Beers from 69 to 82 carats per 100 tonnes. Depending on valuations which have moved with oscillating prices for rough, the asset value of the diamonds to be mined is between $5 billion and $7 billion. Last year, after a shareholder revolt against De Beers’s involuntary bankruptcy plan for ADC, it was agreed with the US Bankruptcy Court that ADC’s remaining assets, including this litigation claim, would be transferred to a liquidating trust, which would continue the fight against LUKoil. If successful in or out of court, the trust would then distribute the costs and compensation award among creditors and shareholders. The scheme, a voluntary bankruptcy procedure, was proposed by ADC’s principal lawyer, Bruce Marks, and two minority investors, Firebird Global Master Fund, a US investor, and Clive Hartz, an Australian who resigned from the ADC board in protest against the De Beers bankruptcy scheme. They acted together after De Beers had threatened ADC with foreclosure on a loan of almost $10 million, and the abandonment of the two legal claims ADC has been waging since 1998 — in the Colorado District Court, and in the Stockholm international arbitration tribunal. These two proceedings were suspended between April 2008 and January 2009, when De Beers and LUKoil attempted to work together in a joint mining venture for the Grib pipe. That collapsed when the Kremlin’s Foreign Investment Control Committee imposed conditions raising the cost and the unpredictability of the investment. Exactly what the deal-killing conditions were, and who lobbied for them, have never been disclosed. Although ADC then resumed prosecuting LUKoil, the Stockholm arbitration proceeding was abandoned last year by De Beers; the US court case continues in Colorado. 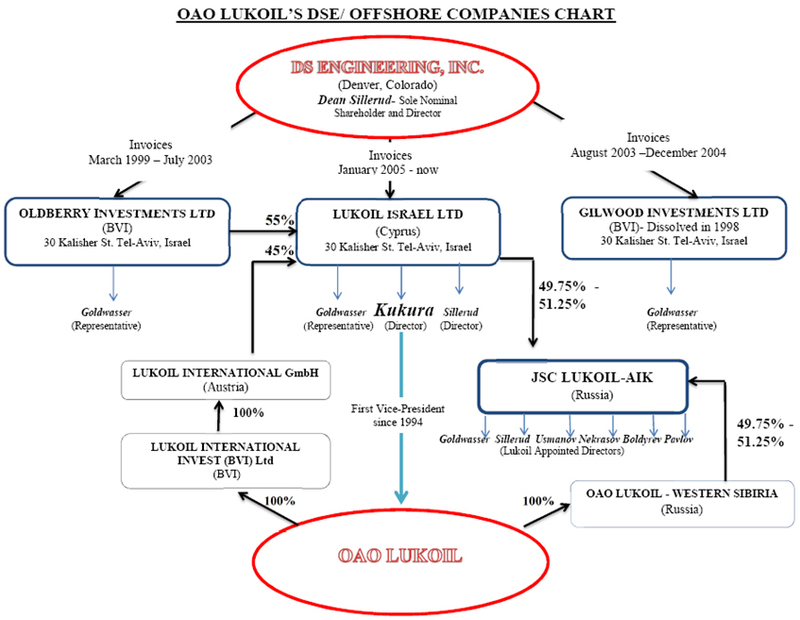 Kukura’s involvement in this and a purported “money laundering slush fund scheme” is alleged by the ADC court filing to have occurred through his direction of LUKoil Israel, which not only controlled shares of DSE, but also engaged in commercial transactions with DSE.